Poached eggs on spaghetti is basically the best thing ever! The breadcrumbs add a beautiful crunchy note that you will absolutely love! Boil spaghetti following pack instructions. Drain. In the meantime, heat oil on medium heat in a non-stick frying pan and cook chili pepper and garlic until fragrant. Remove with a slotted spoon. 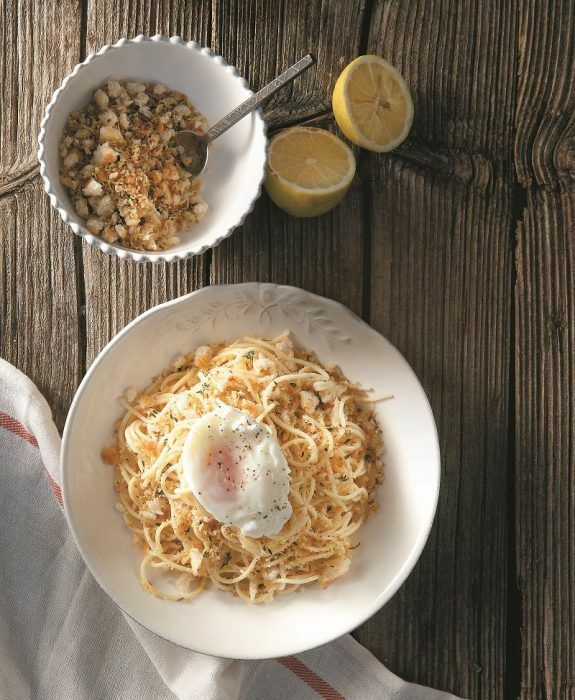 Stir in drained spaghetti, crunchy breadcrumbs and lemon zest. Divide pasta in dishes, top with a poached egg and season egg with salt and pepper. Serve immediately.